As my regular readers will know, I am currently expecting my first baby. Our little man is due to arrive in less than 7 weeks time! Eeeeek! We are as prepared as I think anyone can be - nursery ready, clothes bought, washed and put away, nappies and other essentials all purchased, antenatal classes attended, many books read (more on that in a later post) and a whole host of internet and app based reading done as well. We are a conscientious couple and want to digest as much information about pregnancy, birth, newborns and parenting so that we are fully informed about all the stages of pregnancy and beyond. Those of you who have read my blog for a while will know that my husband and I suffered a miscarriage last year which was an incredibly hard time for the both of us, and this experience has understandably tinged this pregnancy with lots of worry, doubt, and anxiety. It has therefore been vital for us to seek out sound advice, and reliable sources of information in regards to all things pregnancy related. During the early days of this pregnancy I was (of course!) eager to find out my EDD (Estimated Delivery Date/Due Date) and I found a brilliant calculator on the 'What To Expect' website (calculator found here). 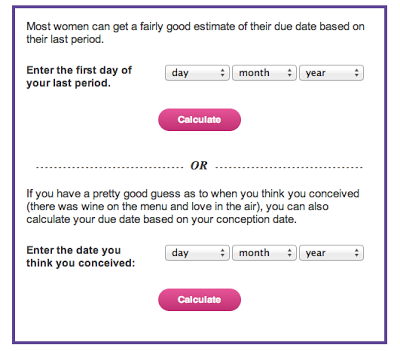 The calculator allows you to work out your due date based on either the first day of your last period, or the date you think you conceived. I found it very quick and simple to use, and a really handy tool - no counting days on a calendar, or trying to work it out in your head. After using the calculator I then couldn't resist browsing their website, which is a hive of information and advice for parents, especially new mums. One of the websites best features is their 'A to Z of Pregnancy Symptoms and Solutions' page, which lists common pregnancy side effects/symptoms. This type of information at my fingertips has been a great source of support to me. As an anxious first time mum-to-be I have checked out and looked up every side effect I've experienced so far. It covers everything from leg cramps, to fatigue, heartburn to a blocked nose - each symptom is explained clearly with helpful solutions to try and make your pregnancy as comfortable as possible. 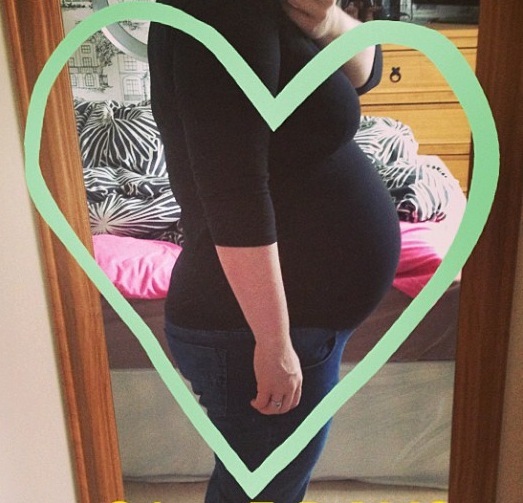 You can also access a week by week account of your pregnancy and baby's development on the site, or sign up for weekly emails straight to your personal email account - all of which I have found invaluable during my pregnancy. I will no doubt visit the site numerous more times before my little Mr arrives, and hope that by sharing my experience of the site it will encourage any fellow new-parents out there to seek the support it offers as well.